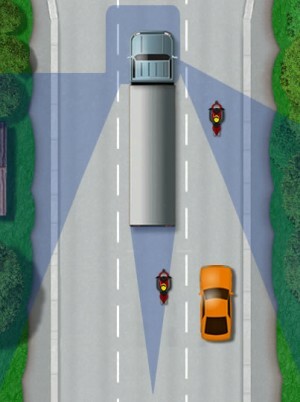 As a vulnerable motorcycle rider, you’ll have two main blind spot issues; your own blind spots and those of other motorists who may not be checking theirs. Most motor vehicles have blind spots. A blind spot is an area that cannot be seen in a vehicles mirrors. The size and location of blind spots depends on the vehicle, though typically large goods vehicle drivers will suffer the most from a lack of observable areas within their mirrors. Blind spots occur to each side of most vehicles and on larger vehicles, the rear is often affected too. If a vehicle is entering an area that is not covered by mirrors, every motorist must check their relevant blind spot before carrying out the manoeuvre. Unfortunately not every motorist checks the blind spot and essentially manoeuvres their vehicle into an area where there could be another vehicle or cyclist. A lack of blind spot checks accounts for many accidents on UK roads each year and as a motorcycle rider, you’ll not have a steel shell to help protect you. As a vulnerable motorcyclist, attending to other vehicles blind spots is as important as your own. 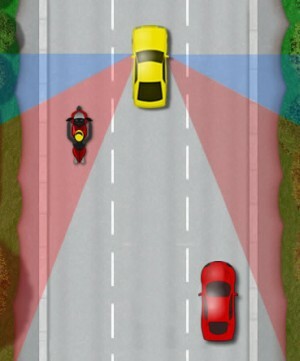 A motorcycles blind spot areas will vary depending on the motorcycle and the type of mirrors used. Some motorcyclists may have blind spot mirrors fitted to aid in reducing the blind area. 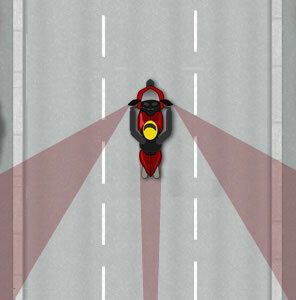 In general however, most motorcycles will have blind spots to the sides and rear as indicated by the red shaded areas in the diagram. A combination of mirror checks and blind spot check should always be performed so you know exactly what’s going on behind you. Check blind spots not only for your own safety, but for other road users before you signal or change direction. Checking the blind spot requires looking behind, which in itself is hazardous as you’re not looking where you’re going. There are occasions when looking behind may be too hazardous. Whilst riding at high speed to overtake or when riding close to a vehicle in front for example. Every motorist should take into account the blind spots of other vehicles, motorcyclists more so due to the lack of protection. As a motorcyclist, ideally you don’t want to be riding in other vehicles blind spots as you have no idea what intentions the driver has and if they check their blind spots. This is obviously unavoidable in some situations, but if you have the opportunity to move out from a vehicles blind area, then do so. A cars blind spot varies as other vehicles due to make, model and type of mirrors used. If we look at the diagram with the yellow car, the red shaded area indicates the most dangerous area to travel in. Blind spots within the red zone, the driver will not see anything unless they physically look rearwards to check. The blue shaded areas represent less of a danger as it relies on the drivers peripheral vision. Still an area best avoided though less hazardous than the blind spot red areas. Larger vehicles will generally be affected with larger blind spots. The blue shaded areas signify blind spot areas where a lorry / truck driver cannot see in their mirrors, or cannot see due to the bulk of the vehicle. Generally speaking, if you can’t see the driver, chances are they can’t see you, which can be hazardous if the driver intends to change lanes. Blind areas more apparent on large good vehicles which extend around the cabin area, the blind spots in the mirrors and a long area to the rear of the lorry that the driver cannot see in. Keep a good distance from all vehicles, especially large vehicles where the driver is unlikely to see you.